The villains are at Kamala's door, and Ms. Marvel has to save a city that doesn't want saving. The malleable Ms. Marvel continues her hero's journey as an enemy from her past begins targeting those closest to her, a challenge that calls into question everything about her -- not just as a super hero, but as a human being! Who can Ms. Marvel trust when everyone in Jersey Cit The villains are at Kamala's door, and Ms. Marvel has to save a city that doesn't want saving. The malleable Ms. Marvel continues her hero's journey as an enemy from her past begins targeting those closest to her, a challenge that calls into question everything about her -- not just as a super hero, but as a human being! Who can Ms. Marvel trust when everyone in Jersey City is against her? As Kamala's life hangs in the balance, a new crimefighter moves in on her turf. Plus: Bruno may be far away at a prestigious school in Wakanda, but even thousands of miles from his former best friend, Kamala Khan, adventure still finds him! To ask other readers questions about Ms. Marvel, Vol. 8, please sign up. very good site thanks? science tech health https://www.sciencetechhealth.com https://www.sciencetechhealth.com/2019/03/the-new-intel-core-i9-9900k-cpu-2019.html ? Are it is About Captain Marvel Story Tell Me? I suspected Trump’s election broke G. Willow Wilson’s brain in the last Ms Marvel book – now I’m convinced it has! Ms Marvel has jumped (Trumped?) the shark – Volume 8: Mecca is so pants, I’m abandoning this title. In the main story, Wilson indulges in the popular far-left fantasy where the normal rules of democracy have been suspended because Trump is a literal Nazi and America is now a fascist state. The New Jersey mayor has been replaced by a right-wing Nazi white supremacist demagogue (read: I suspected Trump’s election broke G. Willow Wilson’s brain in the last Ms Marvel book – now I’m convinced it has! Ms Marvel has jumped (Trumped?) the shark – Volume 8: Mecca is so pants, I’m abandoning this title. In the main story, Wilson indulges in the popular far-left fantasy where the normal rules of democracy have been suspended because Trump is a literal Nazi and America is now a fascist state. The New Jersey mayor has been replaced by a right-wing Nazi white supremacist demagogue (read: Hydra, because this is Marvel) whose self-appointed white Stormtroopers are rounding up Muslims, Inhumans and anyone else deemed not part of the “real” Jersey. It’s an embarrassingly contrived setup for Wilson’s extremist liberal worldview - she doesn’t even attempt to explain why a democratically-elected mayor can be randomly ousted from office because that would reveal the absurdity of the situation! Predictably for someone with such a one-sided perspective, she’s completely unable to write the villains as anything but bland one-dimensional bad guys who aren’t in the least bit interesting. Her SS officer character, Discord, mumbles some crap about acceptance but it’s not at all convincing or remotely indicative of how a real person thinks – it’s shocking how lazy Wilson’s writing has gotten. You can imagine how the tediousness eventually plays out – such a bore. The other story, where Ms Marvel teams up with Red Dagger to stop a runaway train, shows that Wilson knows as little about railways as she does about anyone right of the far left! Apparently in America if a train’s brakes fails, they keep other trains running on connecting tracks and hope for the best. And of course have no other safety measures! And Kamala suddenly has the strength to literally lift a speeding train off the tracks and reattach it seamlessly onto a parallel track. And fuse two tracks into one. And lift up one carriage to slow down the others. If you’re gonna be that silly about it, why not just give her a magic wand to wave? Red Dagger is a mostly pointless addition. He cuts a rope with a knife and then stands back gawping the rest of the time. How does Kamala not put two and two together – she’s amazed he’s here in America after first encountering him in Pakistan, when just a couple pages earlier she met Kareem, who she also met in Pakistan who just happens to have started at her school??? How does she not know it’s him anyway – his scarf barely covers his face! Ditto her mask – why doesn’t everyone, especially her brother, clock that Kamala is Ms Marvel?! There’s suspension of disbelief and there’s this book. After a kind of dwindling of energy and quality and focus in the last few volumes, Ms. Marvel: Volume Eight reveals the team has recaptured its initial zip and sharpness. The story had been working in contemporary political issues, but here they are in full force, as the Pakistani Muslim Kahn (and Kamala’s, aka Ms. Marvel’s) family from Jersey City that we have come to love is now under siege from far right nationalists. To rather specifically echo current trends, Ms. Marvel, a social reformer, After a kind of dwindling of energy and quality and focus in the last few volumes, Ms. Marvel: Volume Eight reveals the team has recaptured its initial zip and sharpness. The story had been working in contemporary political issues, but here they are in full force, as the Pakistani Muslim Kahn (and Kamala’s, aka Ms. Marvel’s) family from Jersey City that we have come to love is now under siege from far right nationalists. 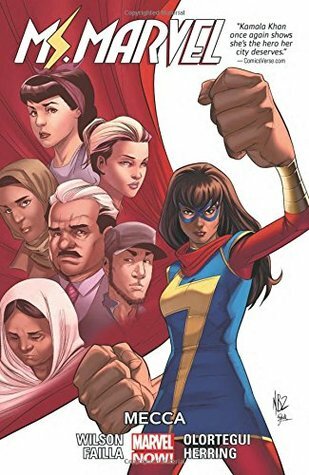 To rather specifically echo current trends, Ms. Marvel, a social reformer, is available to help the needy, but she is demonized in the process by right wing members of her community that want to make itself Great Again by putting in place stricter “immigration” restrictions. Yep, this affects Kamala’s own family, as you might have guessed. As Kamala wonders who she can trust, a former friend (Kareem, the Red Dagger) returns to possibly enter into an alliance with her. Oh, and he’s easy on the eyes, too, which helps, well, everything. The series needs a little fresh “chemistry,” so maybe Kareem is the spice it needs. This was the best volume, in some ways, of all of them, though I thought it lost a little steam with the runaway train endeavor (yawn) near the end. The best aspect of the book is that religious and cultural issues re-emerge as central concerns, as we might have always expected from a series about a Muslim girl superhero whose family is devout! I think this was my favorite volume of the current series. We start out with a story echoing the ugly nationalism that has risen over the last 2 years in the US. Chuck the hipster hydra agent illegally takes over as mayor and starts his own police force, rounding up everyone who is different. They try to make things so difficult for those they've identified as undesirables that they'll move out of Jersey City and go to NYC. Kamala finds herself just as frustrated as many of us have felt since th I think this was my favorite volume of the current series. We start out with a story echoing the ugly nationalism that has risen over the last 2 years in the US. Chuck the hipster hydra agent illegally takes over as mayor and starts his own police force, rounding up everyone who is different. They try to make things so difficult for those they've identified as undesirables that they'll move out of Jersey City and go to NYC. Kamala finds herself just as frustrated as many of us have felt since the 2016 election. I love how things are ultimately not solved through fisticuffs, but the power of the people legally fighting back. I enjoy how Wilson seamlessly incorporates everyday Muslim life into the book, giving us a look into cultures that may be different from our own. Volume 8 of Ms. Marvel ties up the series 2 plot of gentrification and Jersey City. As always, Kamala is endearing and worth rooting for; I did enjoy the first cycle of these comics more (Vols. 1-4) but I will continue reading this series for the foreseeable future. This volume was actually rather interesting if not actually brilliant. We have a new villain and a somewhat usual attack on New Jersey, but underneath the usual storylines, this is where the comic is good. In this case, it really is about belonging to a place and what it means to your sense of self. I like that. This has been said before that if there is any superhero comic currently published that is the modern equivalent of Stan Lee and Steve Ditko's The Amazing Spider-Man, it would be G. Willow Wilson's Ms. Marvel as much like Peter Parker's life, Kamala Khan's is all about balancing her personal life with friends and family, high school and her duties as the local superhero, in which despite her good intentions, it's not helping gaining the public's trust. What was great about the previous volume was This has been said before that if there is any superhero comic currently published that is the modern equivalent of Stan Lee and Steve Ditko's The Amazing Spider-Man, it would be G. Willow Wilson's Ms. Marvel as much like Peter Parker's life, Kamala Khan's is all about balancing her personal life with friends and family, high school and her duties as the local superhero, in which despite her good intentions, it's not helping gaining the public's trust. What was great about the previous volume was that after the slight misstep of the Civil War II tie-in issues, it told a standalone story that balanced the super-heroism with the social commentary, reminding what made this run successful in the first place. However, the consequences of Civil War II haunt Kamala as HYDRA agent Chuck Worthy has taken control as the mayor of Jersey City as he begins to target those close to her. As Marvel has always tried to remain relevant as the All-New, All-Different initiative showcases a racially diverse cast of superheroes, the publisher has never tried to force any political statements. However, what opened volume seven was #13, which was clearly an allegory for the 2016 US presidential election and yet by the time the issue was published, we already got the disastrous results. Throughout the majority of this volume, we see a villain in mayoral charge creates an organisation that is assigned to lock up all the unregistered super powers in the city. As a loose continuation of some of the ideas presented in Marvel's Civil War, it is a combination of comic book fantasy and politics that are not too dissimilar with today's American politics, such as terrorism and immigration. Amongst the super-powered victims (or one who did have powers briefly) are Kamala's older brother Aamir who, after getting arrested, opens #20 with a brilliant monologue explaining the common problem of people's assumption of the image of a terrorist, whether it is simply judging someone by the colour of their skin or whatever religion they're in. Given how serious the messages Wilson is trying to display, she never talks down to her readers as the adventures of Kamala Khan are uplifting, such as our eponymous hero fighting her enemies with abilities that are closer to Mr. Fantastic, with moments of heartfelt realisation. Due to the absence of Adrian Alphona and Takeshi Miyazawa, Marco Failla takes charge of artistic duties as along with series colourist Ian Herring, his cartoony illustrations are appropriate to Kamala's elastic moves, whilst balancing the quiet character drama. Concluding this volume is a two-issue arc, in which Kamala is reunited with Kareem, who is participating in an exchange student program in her high school, much to her dissatisfaction. However, when an ongoing train's brakes have malfunctioned, it looks like a job for Ms. Marvel, but she’s also joined by Kareem's superhero alter-ego Laal Khanjeer (or the Red Dagger). Although it very much evokes Tony Scott's Unstoppable, so much so that even Kamala references the Denzel Washington movie, this is a fun buddy-up with great Kamala-centric humour, whilst Diego Olortegui's art is very detailed and textured as the train takes the heroes through stunning locations in New Jersey. This series remains one of my favorites, in which G. Willow Wilson continues to just write a goofy, down-to-earth highschooler dealing with super powers, and being Muslim in Jersey City. I know you thought I was describing Peter Parker at first. I seriously enjoy learning about Islamic traditions through Kamala's family and friends. But wait, first let me go back and address how the ugly nationalism on the rise in Jersey City, which usurps the elected mayor's seat illegally and ousts her for the This series remains one of my favorites, in which G. Willow Wilson continues to just write a goofy, down-to-earth highschooler dealing with super powers, and being Muslim in Jersey City. I know you thought I was describing Peter Parker at first. I seriously enjoy learning about Islamic traditions through Kamala's family and friends. But wait, first let me go back and address how the ugly nationalism on the rise in Jersey City, which usurps the elected mayor's seat illegally and ousts her for the Hydra-sponsored Chuck Worthy. To which, Kamala responds with bendy Mr. Fantastic moves to against Lockdown and Discord. But more importantly, to which the mayor responds by retaking her position with the backing of the Third Circuit court. Yay, law! Kamala and the Hulk are friends from work. This was an interesting installment to the series. I can’t say that it’s my favorite considering the fact that it had a similar message to the last volume. I was hoping that the series would provide us with something new. I was glad to see that Bruno became a permanent of Wakanda. I really think that this means that his story is going to take an interesting turn. I’ll be looking forward to what will be coming in the next volume. This is probably actually a five-star comic, but it was a little depressing and I resent that it was a little depressing, which is really my problem and not the book's, but still. Enjoyment is ultimately part of my rating system, so, minus half a star, Ms. Marvel! Regardless of how it made me want to punch all humans in the mouth a little, Ms. Marvel continues to be the most solid, contemplative (yet still somehow fun) superhero comic I've read. Granted, that's not as many as most people because This is probably actually a five-star comic, but it was a little depressing and I resent that it was a little depressing, which is really my problem and not the book's, but still. Enjoyment is ultimately part of my rating system, so, minus half a star, Ms. Marvel! Regardless of how it made me want to punch all humans in the mouth a little, Ms. Marvel continues to be the most solid, contemplative (yet still somehow fun) superhero comic I've read. Granted, that's not as many as most people because I find superhero comics ultimately exhausting in the same way I find soap opera and most TV drama series exhausting, but I don't find THIS one exhausting. As I've gotten older, more and more I've begun to crave narrative resolution, and character growth that isn't reversed or upended for the sake of creating new story. In my experience, that can be overlooked easily when you've got endless runs of comics and crossovers to worry about, and then when they're done with one run or storyline, REBOOT. But Wilson, I don't know, man, she's just so good at keeping it all about Kamala. No matter what else is going on in the comics around her, this is a coming of age story about a young superhero, learning to be an adult at the same time she's learning to deal with her powers and the responsibilities and burdens that come with them. I haven't said much about the actual story, and I don't know that I'm going to. Mostly it's just Kamala dealing with some tough times. She and Bruno are still on the outs, and her superhero life is also getting harder. Some very loud people in Jersey City (who are hopefully in the minority) blame her for all the weird things that have been happening, and a certain faction of villains is stoking that fire. Kamala finds it hard to reconcile the fact that yes, some of her activities have brought focus that changed or harmed her city, but at the same time she's saved that same city over and over. And yet, she sees all these people who are angry with her, and what is she supposed to do? I may feel differently about where this one ended up once I read Vol. 9, which looks like it will follow her on her little existential crisis. And OMG WHEN ARE SHE AND BRUNO GOING TO MAKE UP IT'S AGONIZING. I'm not a fan of overly preachy stories, and while I tend to agree with the politics of this graphic novel, I think the plot and characters were sacrificed in pursuit of educating the public. There's much to be said about confirmation basis, but I don't need it, and while I liked some of the plot lines, I'm not sure about the poi I'm not a fan of overly preachy stories, and while I tend to agree with the politics of this graphic novel, I think the plot and characters were sacrificed in pursuit of educating the public. Xenophobia rocks Jersey City in the form of hostile-takeover mayor Chuck Worthy (ugh and LOL - that name . . . ) and his narrow-minded "Keepers of Integration, Normalization and Deference" followers. Who is up to challenge to stop things from going in this very wrong direction? Kamala Khan, of course. Whether she's tussling with wannabe villains Lockdown and Discord or receiving support from tough-as-nails ousted mayor Stella "I'm going to bulldoze [for democracy]" Marchesi and a cameo appearance from a certain Inhuman, Ms. Khan fights the good fight for her family and fellow JC residents but the tone it still largely and appropriately melancholic by the conclusion. Kamala Khan's Ms. Marvel is one of my favorite newer Marvel comics characters. The entire series has been pretty fantastic, but I'd say that this volume is one of the best recent ones. It's not afraid to get very real plus focus on Kamala's family, all while featuring some great action scenes and a fun sense of humor. I particularly enjoyed seeing Kareem, aka the Red Dagger, return in an entirely different setting from his previous appearance. I also loved that Thor: Ragnarok reference, by the w Kamala Khan's Ms. Marvel is one of my favorite newer Marvel comics characters. The entire series has been pretty fantastic, but I'd say that this volume is one of the best recent ones. It's not afraid to get very real plus focus on Kamala's family, all while featuring some great action scenes and a fun sense of humor. I particularly enjoyed seeing Kareem, aka the Red Dagger, return in an entirely different setting from his previous appearance. I also loved that Thor: Ragnarok reference, by the way! Wow, I didn't expect HIM to be Zoe's evil sidekick. Mostly because I forgot he existed but still. Also, a much cooler boy has made a comeback here as well so let's care about him instead. Still loving this as much as the previous. Has great superhero action and story with perfect combination of real world themes/discussion. Keep making this great series. World: Art once again is fantastic with beautifully expressive and charming characters. The world building is simply amazing. This book is so meta textual it makes me so happy. The pieces Wilson adapts from weekdays happening to America right now will blow your brain. Story: Meta to the nth degree. This book has an opinion and message and Wilson has always not shied from that and it's even more so here. There are parts that are a bit heavy handed but it is done so well. The villain see Bullseye. Story: Meta to the nth degree. This book has an opinion and message and Wilson has always not shied from that and it's even more so here. There are parts that are a bit heavy handed but it is done so well. The villain seems stupid at first but the idea that normal people can become this is a hard and frightening reality. Just read it. Characters: Kamala is always great but this arc is deeper, heavier and so much more substantial, so good. Then there's the deceptively meta villain, the wonderful family and wow these characters and their journey is great. So good. This series is just amazing. Surprise, surprise, G. Willow Wilson is on the left of the political spectrum. That's Ok.
She tries to convey an allegorical tale about Trump's politics, people's reactions against each other and particularly those different. That's Ok.
She bends credibility to her needs without flinching. That's not Ok.
Again, Wilson doesn't bother to explain situations. The mayor of Jersey City has been evicted by the Hydra guy we saw in former volumes. Shazam! It looks like it happened overnight, just like tha Surprise, surprise, G. Willow Wilson is on the left of the political spectrum. That's Ok.
Again, Wilson doesn't bother to explain situations. The mayor of Jersey City has been evicted by the Hydra guy we saw in former volumes. Shazam! It looks like it happened overnight, just like that. No clue as to how. Wilson needs a far right front man so he pops up. She needs angry mobs coming out of the blue? Sure, here they are. She needs dedicated minions intent on on applying their hateful new laws? They suddenly walk in line for her convenience. Not to mention the freckled redhead that turned Gestapo to a caricature. Kamala then does a bunch of new tricks, like changing the tracks an incoming train rides on like it was a miniature model or squeezing tracks together to re-frame them, just because it helps Wilson's story. Lazy. That's what comes to mind. G. Willow Wilson is lazy. She wants to tell a story but not the going through the inconvenience of trying to make it credible. She uses her bag of tricks and voila. That's somehow disrespectful, like we can gobble up anything. Hey it's super heroes and it's a comic book so why bother at all? This pisses me off because I'm supportive of Wilson's message and the "Mecca" story was intrinsically not bad. But Wilson's total lack of attention of details to make something plausible of her plot reduces the whole to nothing, some childish views of the world. Another great addition to the Ms. Marvel series. Every time I pick a new volume up, I know that I will find in it action, adventure, cool superpowers put to use, fantastic friendships developed, interesting plot lines (the majority of time), diversity, and a lot of heart. This series could literally never end. Sometimes when I read it I am reminded of Fairy Tail. For those who don’t know this manga series, it’s about a group of people that are part of a guild and go on a lot of quests to earn mo Another great addition to the Ms. Marvel series. This series could literally never end. Sometimes when I read it I am reminded of Fairy Tail. For those who don’t know this manga series, it’s about a group of people that are part of a guild and go on a lot of quests to earn money and recognition, often finding villains along the way. Both series are similar in the sense that villains appear all the time. The reader knows that this could go on forever, since every time a villain is defeated, two appear out of thin air. It is bound to become repetitive and tiring, isn’t it? And yet, I keep on coming back for more, because I know that I will not rest peacefully if I don’t know what will happen to the characters next. Ms. Marvel and Fairy Tail progress very slowly and both adore teasing us with romantic relationship possibilities for the protagonists, but I for one will keep on wanting more. The last two chapters are the best. Ms. Marvel is reunited with a character she put at the back of her mind and thought she would never see again. Once again the ending is dramatic and implies that more will follow and that Ms. Marvel isn’t done growing up yet. That’s fine, we’ll cross that bridge when we get there. This review has been hidden because it contains spoilers. To view it, click here. Yes. I missed Kareem! And I KNEW he was Red Dagger. It's gonna be a long wait until the next volume!! Source of the book: Amazon wishlist gift from goodbyebird. Thank you! This volume is made up of 2 stories. The first is made up of 3 issues, and was the better of the two. It deals with a lot issues that are very close to home with hate, fear and discrimination. It was hard to read at times, and I was wondering just how dark the series was going to go. I don't want to spoil anything, but I will say I thought it was well done. The second story felt like more of a transition. It brought back a character from earlier in the series whose details were a bit hazy to me. It's been a bit of a stretch since I read the last few volumes of this. Thankfully there was enough of a reminder built in without rehashing plot that I think I'm mostly good. The story of these two issues was kind of bland, but the ending set up for some hopefully interesting issues ahead. I'd give the first story a 4 and the second a 3, so overall I'm giving this volume a 3.5. Apparently there are 2 different artists. One for each arch. I honestly didn't really notice the difference. I'm not sure what happened with the original artist. I don't recall if he drew the last volume or what but the artwork throughout was solid.